Well, it looks like the crew over at Razer has done it yet again. At a press event at the Dolby Theater in San Francisco, Razer recently unleashed what they’re claiming to be the world’s thinnest and most powerful 14″ notebook on the market – the Blade 14″, and they’re probably right. A couple days ago, Razer released a teaser video for asking gamers “What’s Thinner Than a Dime?” and it seems like the Razer Blade 14″ coming in at 0.66″ thin is what. Like the original Razer Blade, the Blade 14″ is once again designed completely in house by Razer. Sporting a 14″ 1600×900 LED backlit screen, anti ghosting gaming grade keyboard, an Intel 4th Generation Core processor (aka Haswell), 8GB DDR3L 1600MHz memory, Nvidia GTX 765M & Intel HD4600 graphics (switchable via Nvidia Optimus), the option of a 128GB, 256GB, or 512GB SSD, and a 6 hour battery life, the Razer Blade 14″ is quite phenomenal on paper – especially compared to most of the Ultrabooks on the market, which lack any sort of discrete graphics. In comparison to currently existing 14″ gaming notebooks on the market such as the Alienware M14x (1.49″ thick, 6.45 lbs) for example, the Blade 14″ (0.66″ thick, 4.135 lbs) is considerably thinner and lighter. In addition to its powerful specs, the Blade 14″ isn’t short on connectivity options either, sporting 3x USB 3.0 ports, 3.5mm microphone/headphone combo jack, 802.11 a/b/g/n wireless via Killer NIC N1202, Bluetooth 4.0, and HDMI. The Razer Blade 14″ is expected to be available for pre-order on June 3 and will start at $1,799 via the Razer website. 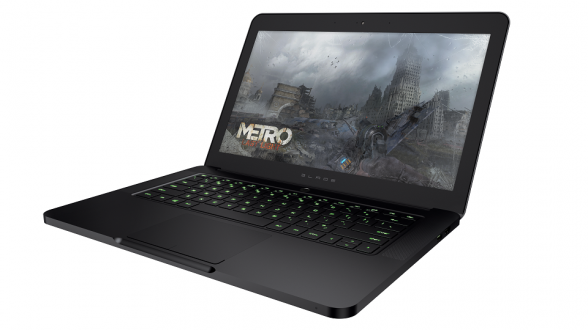 In addition to the introduction of the Razer Blade 14″, Razer has gone ahead and updated the original Razer Blade as well with the same hardware being introduced with the Blade 14″ (Intel 4th Generation Core Processor, Nvidia GeForce GTX 765M). To help differentiate the 17″ and the 14″ Blade, Razer is renaming the 17″ Blade to the Blade Pro and the 14″ will just be referred to as the Blade. The Razer Blade Pro will be available shortly as well and may be ordered via the Razer website. Razer™, the world leader in high-performance gaming hardware, software and systems, today unveiled Razer Blade, the world’s thinnest gaming laptop. The Razer Blade, measuring in at just 0.66-inches thin, packs more power-per-cubic-inch than any other laptop in the world. The Razer Blade is powered with a future 4th gen Intel® Core™ processor, the latest NVIDIA® GeForce® GTX 765M GPU and utilizes solid-state storage technology with boot speeds of up to four-times faster than a traditional 5400-RPM notebook hard drive. The Razer Blade has a rigid all-aluminum chassis, with a stunning 14-inch LED-backlit HD+ display and features a custom-designed trackpad and backlit gaming grade keyboard. The new 14-inch Razer Blade embodies Razer’s continuing goal to design the world’s best gaming laptops for those that need insanely powerful performance in the thinnest form factors to game anywhere, anytime. Razer sets out to do the impossible without compromising performance and, with the new Blade 14-inch laptop, users are able to game more and do more than ever before on an ultra-portable system. 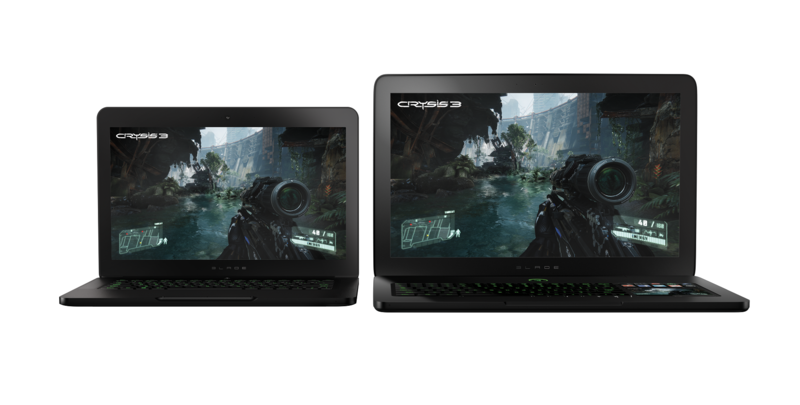 The Razer Blade will be available for pre-order June 3. For more information, go to www.razerzone.com/blade.